﻿ Granada 0-4 Real Madrid. Still solid like a rock! 06.05.2017 » Granada 0-4 Real Madrid. Still solid like a rock! 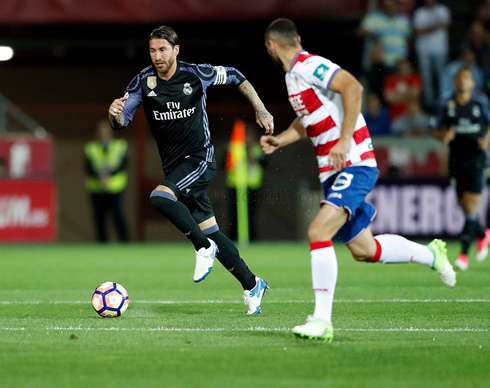 There weren't many obstacles for Real Madrid to come out of Granada with a win this Saturday evening, as they easily beat their opponent by 4-0 with two goals from James Rodríguez and another two from Álvaro Morata. Another 3 points and one game less in the calendar... Real Madrid found no trouble to get past Granada this Saturday night, running over the locals with a very solid 4-0 win. James Rodríguez scored a brace still inside the first quarter of an hour and then Álvaro Morata doubled the lead by also scoring two goals of his own. Zidane once again rotated most of his key players and the substitutes clearly responded in fashion! The Merengues still have 1 game in hand, but with 3 fixtures left in La Liga and Barcelona determined to win all their matches as well, they simply can't afford to lose any of the upcoming games. First, they managed to keep a clean sheet which has been a rare occurrence this season and second, they were able to put away the game early. Again, the famed "B" team was playing - Lucas, Morata, James, Kovacic, Danilo and even Fábio Coentrão were given a runout today against the already-relegated Granada. James and Morata, however, were up to the task, both players scored a brace before the 35th-minute mark and effectively killed off the game early on. 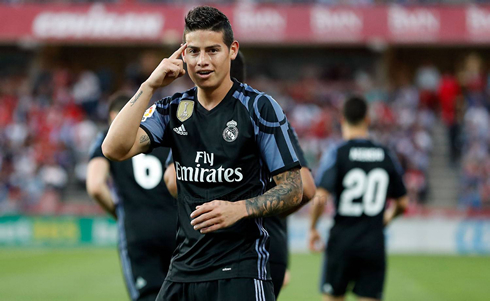 James scored from a Vásquez cross and a header after another cross from Coentrão. 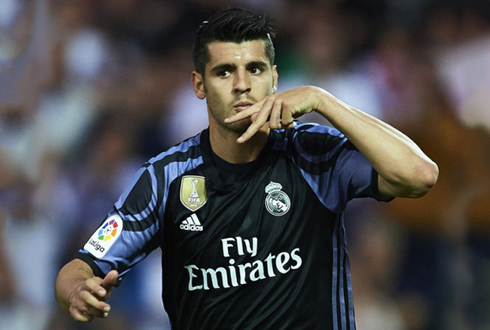 Morata on the other hand, smashed in a center from Danilo and scored a wonderful solo goal to cap off a fantastic half for Madrid. In the second half, Real Madrid were quite wasteful in front of goal, but it didn't matter too much as the match was already beyond all doubt. The combinations, however, were as good as usual. This recent combination of the "B" team in La Liga and the starting team in the Champions League seems to be the perfect mix as both teams perform optimally. 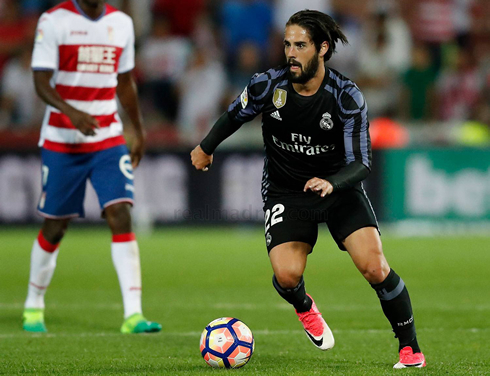 The last three games of the La Liga season, however, will throw this to the test, as Madrid face off against Sevilla, Malaga and Celta Vigo, three difficult sides. But it was again nice to see such a professional performance this late in the season. The only real disappointment is Karim Benzema. The Frenchman was brought on with 30 minutes to go, Zidane likely trying to build his confidence ahead of the Champions League, but again, he left so much to be desired. He's still likely to start in the midweek, but it's becoming harder and harder to justify not giving Álvaro Morata a real shot. Onto the second leg and hopefully securing out berth in the UEFA Champions League final. Cristiano Ronaldo next game is a Champions League fixture, on May 10 of 2017 against Atletico Madrid. You can watch Juventus live stream, Atletico Madrid vs Real Madrid, AC Milan vs AS Roma, Arsenal vs Manchester United, Liverpool vs Southampton, and Freiburg vs Schalke 04, all matches provided from our football live game pages.